What's in a sugar shack meal? If you're vegetarian, gluten-free, or on a diet, you might not want to know. As for everyone else, allow us to introduce to you a piece of edible heaven, a feast of dyspeptic proportions should you do something wildly out of control like, say, grab seconds. If there's any tradition that unites the most Quebec foodie items on one plate, it's a local custom observed every cusp of spring in the quintessential cabin of cabins, the cabane à sucre. Locals and visitors flock to Quebec sugar shacks every winter and spring. Why? To eat Quebec soul food, obviously. It's hearty, rich, and wonderful. Never had an authentic sugar shack meal before? Consider this your walk-through. Any self-respecting cabane à sucre serves pea soup. But not green pea soup. Nor split pea soup. Just thick, whole yellow pea soup simmered for up to two hours with a hunk of ham hock stewing in the middle of it all. Quebec's answer to pâté, cretons are basically ground pork with breadcrumbs and spices commonly used as a breakfast spread or, in the case of sugar shacks, served as a starter spread on bread rolls. The texture is nothing like pâté though. Cretons are lumpy and there's no jelly component. It's tempting to fill up on bread and cretons at the beginning of a sugar shack meal, but don't do it–there's a lot more to come. Ham isn't the most exciting dish on the sugar shack roster, but most traditional meals will include it. The pig is strong in the sugar shack meal. Behold pork links, sausage accouterments essential to the proper functioning of a cabane à sucre experience. While pork sausages and ham are pretty much a given at a sugar shack meal, meatballs are rare, but a big part of the experience at Cabane à sucre Charbonneau. Tourtière is Quebec's rendition of the common meat pie traditionally mixing pork with beef (adventurous types might also toy with veal, turkey, and lamb) to create one of the region's best-known signature dishes, a custom any Quebec cabane à sucre would be hard-pressed to leave out. Usually, tourtière is served in pie slices but single servings resembling pizza pockets or calzones have been known to make their way onto the sugar shack circuit. Before digging in, ask if the shack has homemade fruit ketchup on hand. Generally composed of tomatoes, onions, peaches, and pears, it is made to go with tourtière. Oreilles de crisse (French for "Christ's ears") are technically meat-free, but meat-free deep-fried pork fat. Sometimes pork skin is used, other times, it's pork belly (salt pork). And the name may suggest a divine experience but you either love them or avoid them. That's right. These legumes might seem vegetarian-friendly, but they've been baking for hours in pork fat. Eggs round out the main course of a successful, traditional, all-you-can-eat sugar shack meal. They're usually served as a large plain omelette which patrons share amongst themselves at a given table. We've also seen the traditional omelette replaced with creamy scrambled eggs. Additional sugar shack sides to be expected include home fries, pickled beets, pickled onions, baby gherkins, coleslaw, and the pièce of pièces de resistance: maple syrup. Glorious, gooey maple sap boiled until it's thick and syrupy. Grand, gratifying sweetness that should absolutely be poured on everything on your plate (except on maybe the beets and coleslaw). It is joy, rapture and the only way to eat a sugar shack meal. Your taste buds just haven't lived until they've sampled a sodium smorgasbord of lard-smeared sugar shack fare soaking in a pool of syrupy, woodsy saccharine. There should be readily identifiable bottles of maple syrup on the table. If there are none and you actually have to ask for syrup, then you may not be in a sugar shack. Exit the premises immediately and book a meal at a real cabane à sucre. Even when you think you can't eat anything more, have a slice of maple sugar pie. Think pecan pie minus the pecans plus a je-ne-sais-quoi essence of tree bark. Some of the best pouding chômeurs (French for "unemployment" or "poor man's" pudding) in the world have a dense bread pudding consistency with copious canals of gooey, liquified brown sugar and/or maple syrup threading through each irregularly shaped piece. Others are manicured, shaped into cakey picture perfection with a syrupy bottom rather than the veinous network of saccharine. A pet de soeur–phonetically, PET-DUH-SEUR–is a traditional Quebec pastry covered in butter and seasoned with sugar, maple syrup, and maybe even cinnamon. Sometimes the texture is comparable to a flaky pie crust. Other times it's light like a puff pastry. You might even stumble on a batch homing in on the density of bread pudding. Though so very Québécois, pets de soeur are one of the lesser common sugar shack desserts, usually usurped in exposure by the likes of sugar pie, unemployed person's pudding, and pancakes. To get all three in one meal is a privilege. 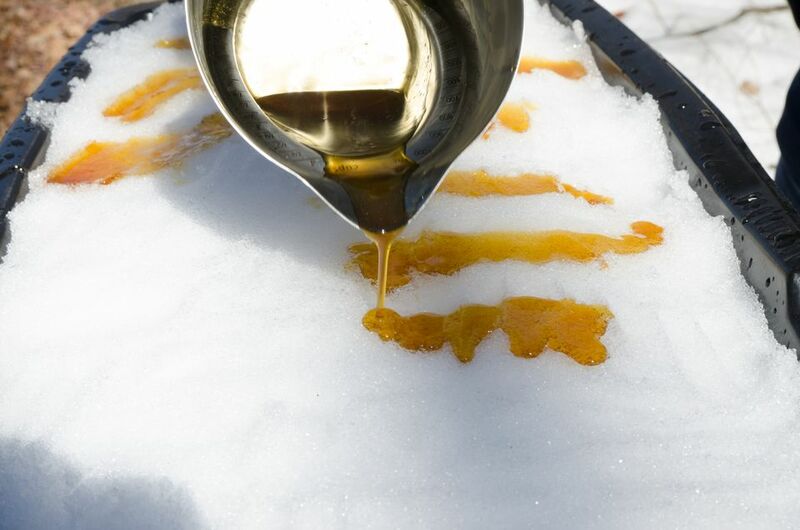 Maple taffy on snow is a childhood rite of passage in Quebec, much like sugar shack attendance itself. Not-so-coincidentally, consumption of maple syrup's thicker, stickier self is part and parcel of the cabane à sucre experience. Sometimes the hot taffy on snow precedes the sugar shack feast. Other times, it concludes it. In the case of select sugar shacks near Montreal, you can have your taffy and eat it too whether prior to or after the heavy meal.